Preparing traditional dishes is never straightforward as everyone has their own view on how they should be prepared. There is nothing more soul-destroying than spending several hours cooking a meal only to get a look from your husband that says “these are not as good as my mother’s”. I have received that look many times as I developed my recipes for šaltibarščiai, koldūnai and cepelinai. With my balandėliai, I a little fared better – I got “the look” for the first attempt only. After that, something unprecedented happened – I was told they were even better than his mother’s. 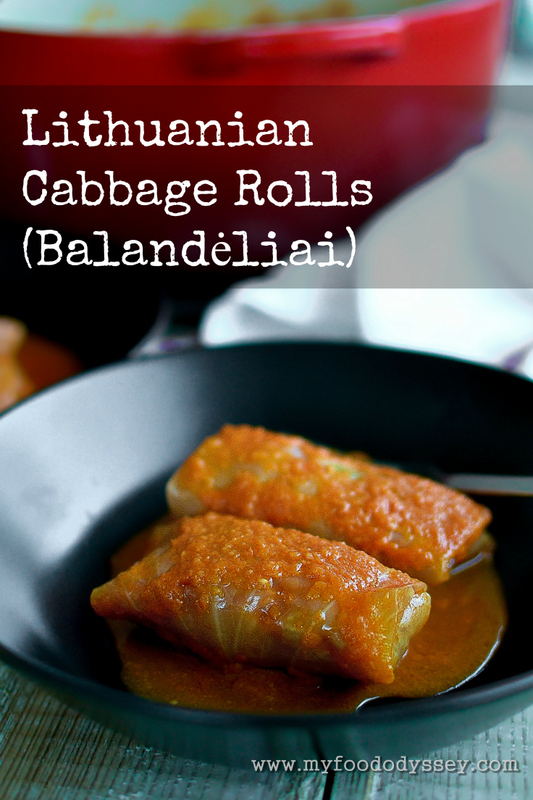 Balandėliai (bal-and-elle-ay) are Lithuanian cabbage rolls stuffed with seasoned pork mince (ground pork) and rice and usually served with a creamy tomato sauce. Balandėliai literally means “little pigeons”, so called because of the prevalence of the birds here in spring. The same name (in local language) is used across a number of countries, including Poland, the Czech Republic and Belarus. However, similar dishes can be found in many countries, including the Balkans, Central, Northern, and Eastern Europe, as well as West Asia. In Lithuania, balandėliai are typically made with white cabbage, which is widely available and inexpensive. I have to admit that I prefer both the taste and texture of balandėliai when they are made with dark green Savoy cabbage. (I also love that the sauce gets caught in the little groves in the leaves!) However, to preserve tradition and to prepare the dish that my husband remembers from his childhood, I am making them here with white cabbage. Feel free to substitute per your own personal preference. Balandėliai are not particularly difficult to make, but they are a bit fiddly and time-consuming, so I recommend making them in large batches. I generally make about 20 at a time, which is the most that will fit in a single layer into my large Dutch oven. Most home cooks that I’ve observed making balandėliai make the sauce by adding ketchup and sour cream to the cooking liquor at the end of cooking, thickening with potato starch as needed. I’m not a fan of ketchup and I also don’t like the idea of having to remove all the rolls from the pot to finish the sauce. Instead, I have developed a sauce that replicates some of the tang and sweetness of ketchup, is runny enough to allow the rolls to cook yet thick enough to serve as a sauce without any last minute finishing. Note that because of the small amount of liquid used in the sauce you need to ensure your saucepan has a tight-fitting lid so the liquid doesn’t boil off during cooking. This recipe is no longer available online. For the full recipe and detailed, step-by-step instructions, please see my cookbook, available from just $2.99 here. The book contains all of the most popular Lithuanian recipes including cepelinai (potato dumplings), šaltibarščiai (cold beet soup) and kugelis (potato pudding), plus stories from my life in Lithuania and colour photos of the stunning Lithuanian countryside. INGREDIENTS: For the sauce: 400 g | 14 oz can of chopped tomatoes 1 large onion (150 g | 5 oz approx), peeled and cut into chunks 2 heaped Tbsp sour cream (30% fat*) 1 tsp salt 1 tsp sugar 1 Tbsp apple cider or white wine vinegar 200 ml | 7 fl oz cold water *If you use cream with a lower fat content it may split during the long cooking time. For the rolls: 100 g | 3.5 oz uncooked white rice such as basmati or long grain* 1 tsp salt (for cooking the rice) 1 large head white cabbage (2.5 kg | 5.5 lb approx)** 700 g | 1.5 lbs pork mince (ground pork) ¼ tsp salt (to season meat) ¼ tsp garlic powder 1 tsp onion powder * If using pre-cooked rice you need 280 g | 10 oz. ** You will not need the full cabbage. However, starting with a large head gives you larger leaves which are easier to roll. Save the remaining cabbage for sauerkraut. METHOD: Bring a medium saucepan of water to the boil. Add 1 tsp of salt and the uncooked rice. Cover with a lid, return to the boil, then reduce the heat and simmer for 10 minutes (or per package instructions) until the rice is soft. Drain, rinse well with cold water to cool down the rice and place into a colander to drain and cool fully. Cut around the outside of the cabbage about 5 cm (2 inches) from the root. Work your way round a number of times until you have removed the end and part of the heart. Place the cabbage cut-side down in a saucepan and cover with water. Bring the water to the boil, reduce the heat and simmer for 10 minutes. Drain well and set aside to cool. (The cabbage will contain a lot of water, so if you remove it from the pot be sure to put it in a bowl so water doesn’t run over your worktop.) To make the sauce, place the onion, tomatoes, salt, sugar, vinegar and sour cream into a food processor. Blitz until smooth. Add the water and blitz again. Transfer the sauce to a large (7 litre / quart) saucepan. In a large bowl, mix the mince (ground pork), rice, garlic powder, onion powder and salt. Mix with your hands until thoroughly combined. When the cabbage is cool enough to handle, gently remove about 20 leaves. Take care not to tear the leaves, but don’t worry about small tears or cracks. I find that running a spoon gently under the leaves helps them to come away from the head. You are now ready to roll your balandėliai. Take one leaf and lay it flat on your work surface with the root end towards you. Take about 1 tablespoon of the meat mixture and form in into a roll about 5 cm (2 inches) long. Place the meat just inside the root end of the leaf. Roll the end over the meat until it touches the cabbage behind the meat. Gently fold in one side of the leaf and then the other (as shown in the diagram), then continue to roll to the end of the leaf. Place the roll to one side and continue to roll the rest of the leaves. I find that the outer leaves are a bit easier to roll than the ones deeper in as they have been softened more by the boiling water. Don’t worry if some of the leaves crack a little as you’re rolling them. Unless they split badly they will stay together during cooking. Arrange the rolls in a single layer on top of the sauce. They should be packed tight enough to stop them unrolling during cooking but not so tight that they pop up out of the sauce. Depending on the size of your rolls, you should fit 15-20 rolls into the saucepan. At the start of cooking the sauce should almost cover the sauce, but more liquid will come out of the cabbage during cooking. Resist the temptation to add more water at the early stages or you will end up with a runny, insipid sauce. Place the saucepan on a high heat and bring to the boil, then cover tightly with a lid and simmer gently for 1 hour. Remove one roll from the pot and cut it across the middle. Taste a small piece to see if the cabbage is cooked to your liking. (The meat will be fully cooked at this point.) The cooking time can vary depending on the type of cabbage used and the size and thickness of your leaves. If they are still a little underdone, replace the lid and cook for a further 30 minutes or until the cabbage is cooked to your liking. If there is less liquid than there was at the start of cooking or if the sauce shows any sign of sticking to the pot, add a small amount of water (about 100 ml | 3.5 fl oz) to the pot before continuing. Serve with boiled potatoes and plenty of the sauce. I haven’t tried it, Teri, but I can’t see why not. All the elements freeze well. Brassicas are among the best veg for holding their form when frozen, so the cabbage should come out just as firm. I’ve frozen similar sauces in the past. I think I would cook them fully and then freeze in portion sizes in ziploc bags. If you lay the bags flat when freezing you end up with flat packs which are easy to stack for storage! Exquisite..sooo tasty looking. Now I understand the need for natural light when you redid your kitchen. The food shots are drool inducing marvels of art. Thank you, Kim! Good light is key, both to photos and to my mood! Those look delicious! My mom makes amazingly delicious cabbage rolls! She uses pickled cabbage leaves though – a Macedonian tradition. Absolutely delicious! Thanks Nancy! A few people have mentioned making them with pickled cabbage. I’ll have to try making sauerkraut with whole leaves – I imagine the sourness would bring something delicious to the dish. It adds a layer of complexity to the flavor. I just love it! Thank you for bringing back memories of my grandmothers cooking. My mom and immediate family came to the US right after WWII after my mom married dad, a Hispanic soldier from the LA area. We had cabbage rolls often weekly. Grandma experimented blending Mexican cuisine with Lithuanian recipes…not always successfully as I did not like herring enchiladas. She may have been the first person I know who made fish tacos. Love your recipe and inspired to make them this Saturday. Ooh, I’m not sure I like the sound of herring enchiladas either. I like fish tacos, though! Very happy to have brought back some happy memories for you. I hope you enjoy the balandeliai if you get to try them. June, they look delicious…I’ll definitely give them a try very soon. On a more sobering note regarding the ‘Mother Factor’ it reminds me of an unfortunate incident at a family gathering some years ago. It was a cold evening in early February and we had a get-together for Pancake Tuesday (Shrove Tuesday). It’s a sort of Religious Holiday that commemorates the commencement of Lent whereby we were expected to ‘fast’ for 40 days just like Jesus did many years ago in the wilderness. Shrove Tuesday is followed quickly by Ash Wednesday when we as children were ushered out to ‘Mass’ to have the Parish Priest smudge our forehead with holy ash from burnt bushes behind the church. So over the years Shrove Tuesday evolved into Pancake Tuesday, a Feast Day in preparation for the long lean winter ahead. So anyway, there we all were in my brother’s house tucking into a mountain of fresh pancakes just off the pan when my brother, in a moment of melancholy and in homage to our mother who had passed away a few months earlier, made the thoughtful, but some would say foolhardy, comment “My Mother made the best pancakes in the world…ever”. Some of us, glassy-eyed in reflection (but probably influenced by the few preliminary glasses of vino) were about to nod in agreement when the latest batch of pancakes from the pan came crashing down on his head. Thankfully the pan itself missed its target otherwise this would not be the amusing recollection I put to pen today! With the melee and confusion that followed the actual culprit for ‘The Incident of the Flying Pancakes in the Night’ was never positively identified but we had our suspicions. Suffice to say that on every subsequent Pancake Tuesday my brother made the worldly declaration to the effect that “These are indeed the best pancakes in the world…ever”. I digress…Arunas, be careful out there buddy! My balandeliai are always flat and boring tasting. Then my son taught me the value of a touch of vinegar. Looks like you already knew that. Maybe that’s why ketchup is so popular–sweet, salty, and sour… I’m looking forward to trying your recipe next time. Also, I love the way you cut the cabbage to get the leaves off. What a great idea. Thanks! Thanks Susan! Yeah, a small amount of vinegar is great for giving dishes a hint of acidity. Cutting the tail off before you parboil the cabbage makes it so much easier to handle later. Plus, it fits in the pot better! Awesome job! I think foreign foods are great, but these look divine!